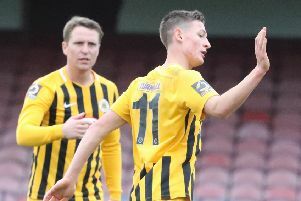 Max Wright is keen to extend his Boston United stay until the end of the season. The Grimsby Town player concluded his youth loan by scoring a superb strike to earn the Pilgrims a 2-2 draw at York City on Saturday. But as he prepares to turn 21 at the start of next month, the terms of his loan will have to be renegotiated. “I’ll have to speak to the gaffers at Grimsby and see what the plan is as the season’s coming to an end,” Wright said. “I’d love to extend it if the boss and gaffer would like to and Grimsby are happy with it, if I’m not going to play. Boston manager Craig Elliott is also keen to keep Wright on board. “We had talks two weeks ago and they were happy for us to extend it until the end of the season,” he told The Standard.